Wrightsville Beach, one of the two barrier islands on the Cape Fear Coast, is a place unlike most other coastal areas. Established in 1899, the island was once accessible only by water. Today Wrightsville Beach is a popular destination for weekend getaways and annual vacations for generations of families who return year after year. A relaxed and friendly atmosphere prevails in this beach community that radiates a village-style charm. A clean and uncluttered five-mile stretch of white sand and sparkling water invites a day of beachcombing, swimming, sunbathing, surfing, and pier or surf fishing for a truly pleasurable experience. For the athletic at heart, there's a city park with lighted tennis courts, volleyball and basketball courts, football and soccer fields, or the Loop, a fitness trail that circles the inner island. Boaters can enjoy the full-service marinas and charter cruises available. History buffs will enjoy the island's museum of history and narrated scenic cruises along the Intracoastal Waterway that offer a glimpse into the island's past. The annual Lumina Daze festival and Castles & Scoops Sand Sculpting Contest, held each summer and the NC Holiday Flotilla are among the annual events that celebrate the island's nautical and cultural heritage. A variety of fine accommodations range from full-service resorts and family motels to luxurious cottages and condominiums. Exciting nightlife and some of Cape Fear Coast's finest seafood restaurants are located on the island and just across the bridge. 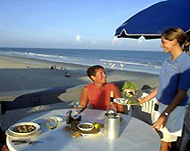 Come and partake of the pleasures that await you at Wrightsville Beach.